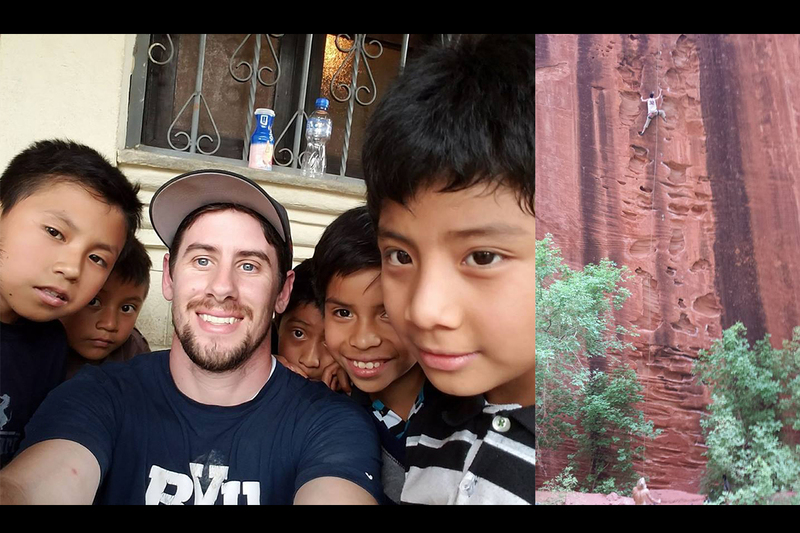 Whether visiting an orphanage in Guatemala, scaling a rock wall or tackling an Executive MBA degree, Nathan Marsh is up to the challenge. Nathan Marsh (Cohort 16) is an experienced rock climber who often spends his free time exploring Utah’s rock formations with his wife, four children, and long-time friends. “Rock climbing is all about having the right skills, knowledge of the terrain, and trust in your fellow climbers – knowing that your climbing partners are there for you and you for them; appreciating that there’s always something new to experience and learn, and most importantly enjoying the journey and getting lost in the moment. It can be challenging, invigorating, satisfying, and at times, even transformational,” said Marsh. The analogy between rock climbing and pursuing his UNLV Executive MBA is not lost on Marsh. “The UNLV EMBA program is about scaling new heights. The experience is challenging, surprising, energizing, tiring, and definitely transforming,” said Marsh, who currently holds the position of Washington County (Utah) Area Director for Chrysalis, a for-profit social services organization. As director, he oversees the contributions of roughly 250 staff members, while managing the development and implementation of the organizations’ social service programs for individuals with intellectual and developmental disabilities. Every other weekend, Marsh boards the St George, Utah shuttle for the 120-mile ride to Las Vegas and his UNLV EMBA classes – a commute Marsh uses to put the finishing touches on homework assignments. “At least that was the plan. In actuality, I usually grab a quick nap before hitting the books,” he admits. Marsh knew he wanted to pursue an advanced degree to increase his business knowledge and management skills but was wary his fellow cohort members might not relate to the social services industry. “I started the program believing I was there strictly for the education, anticipating that I wouldn’t benefit as much as others from the cohort experience. I was so wrong,” said Marsh. “UNLV’s EMBA program isn’t just about taking classes. No matter what industry you’re currently working in, the program is an extraordinary opportunity to engage with a diverse, accomplished cohort about real-time business challenges; to learn from industry leaders; and to create a network of life-long friends,” he said. Commenting on one particular business challenge, Marsh said, “the social services industry is notorious for high turn-over especially at entry-level positions. I wanted to change that pattern at Chrysalis.” With input and advice from his fellow cohort members, Marsh applied his classroom experience to his job, implementing training programs that have significantly reduced turn-over. “In my opinion, the value of any business school is about 20 percent learning from professors and 80 percent exchanging information, ideas, help and laughs with classmates. I never anticipated how much I would value and appreciate my fellow classmates. They are an amazing group of individuals with whom I am lucky to take this journey. They are a huge part of why I have been able to learn so much from this amazing experience,” said Marsh. Since graduating from Brigham Young University with an undergraduate degree in Psychology and a minor in Business Management, Marsh has concentrated his professional aspirations in the social services arena. With a strong passion for serving and helping people, he has spent the majority of his 12-year career with Chrysalis. He first joined the Utah-based company as an intern working as direct care staff and residential manager in the Provo-Orem area. After a brief stint as a behavioral coach in California, Marsh returned to Utah and Chrysalis as associate director in the St. George area. As Chrysalis’ presence in the region grew, Marsh was soon promoted to area director where he has overseen the region’s growth from 30 to 250 employees. A typical work day for Marsh usually means managing all functions of regional operations to ensure quality of services and financial viability of the company. He also oversees clients’ contacts and serves as a liaison between Chrysalis and state funding agencies. Additionally, Marsh works with human resources; focuses on team building; manages budgets; and more. Even with his mounting responsibilities, Marsh continues to make time for his favorite part of the job - spending time with the individuals who benefit from Chrysalis’ services to ensure that they are living happy and fulfilled lives.